Re-envisioning Sir Arthur Conan Doyle’s Sherlock Holmes and Dr John Watson as African Americans living in New York City’s famous Harlem district. Watson, an Afghanistan war vet, works in an inner-city clinic; Holmes is a local P.I. who takes unusual cases. When one of them ends up in Watson’s emergency room, the unlikely duo strike up a partnership to find a missing girl. Watson & Holmes bump heads along the way as they enter a labyrinth of drugs, guns, gangs and a conspiracy that goes higher and deeper than they could have imagined…. Y’know, when I’d first heard that the character Sherlock Holmes had entered the public domain a couple of years ago, and therefor could be used by anyone, I’d briefly entertained the idea of doing my own take on the character. But the truth is that mystery-writing is just not my thing. I could turn Holmes into some sort of generic crime-fighter, instead of detective, but that seems to miss the whole point of the character, so the thought never continued. I haven’t had a chance to catch any of the BBC Sherlock TV series, but I have seen a few episodes of CBS’ Elementary, and it’s not bad. But now, Brandon Perlow of New Paradigm Studios has come up with their own unique take on the Holmes mythos, reimagining both Holmes and his partner Watson as Black men, living in present-day New York, in a story written by Karl Bollers and drawn by Rick Leonardi. I won’t spoil too much more, but thanks to more deductive reasoning, and clever slight-of-hand, Watson and Holmes track down Junior, learn that some men who appear to be former military, now working as mercenaries, are after him before of his cocaine connections, and then use him to set up a meeting with the men and get to where Trina is being held. Along the way, we also learn that Watson is a military veteran, a para-jumper, who served in Afghanistan, and that this mission has some kind of connection to the dead infant from the beginning of the story. I loved this portrayal of Holmes, as he is written as man who gets respect from local police and criminals alike, and always seems to know a little bit more than he initially lets on. There’s also a little running gag with people continually referring to Watson as “doctor”, and he has to correct them that he’s just a medical intern. Bollers knows his Holmes history, and Leonardi’s art fits the tone of the story perfectly. It’s a great combination. I wish I were a Hollywood producer with a spare $50 million, as I’d love to option this and make it a film or TV series. 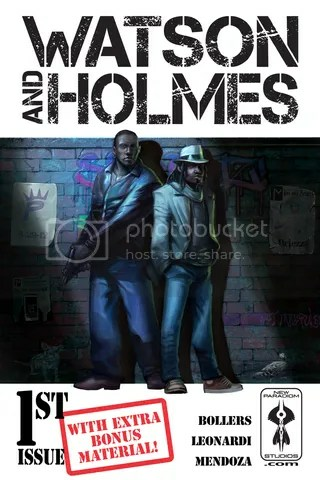 Watson & Holmes #1 is available, for a mere .99 cents, on Comixology.